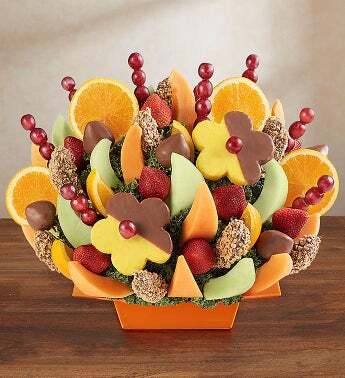 Our best-selling fruit arrangement is the ultimate party pleaser! Available in two sizes, this abundant assortment is loaded with a juicy mix of dipped pineapple daisies, strawberries, melon, oranges and grapes. Highlighted by decadent dipped toffee-covered apples, it’s served up on a reusable tray to turn every day into an instant celebration.